you have too much asparagus? Next Post Are You a Girl Blog or a Boy Blog? Sometimes simple food is the best food. Savory and delicious. Asparagus is my vegetable candy. I love it! Don’t think you can have too much asparagus. I always steam it or use it in risotto. I don’t know why I never thought of baking it. Hope I remember the next time I have asparagus to cook. No, never. I’ve taken to making more than we can eat so that I have some to chop up for salads, but it doesn’t ever work out the way I think it will (full tummy, not enough left overs). you can certainly NEVER have too much asparagus, especially prepared in this manner. the natural flavor pops best this way. 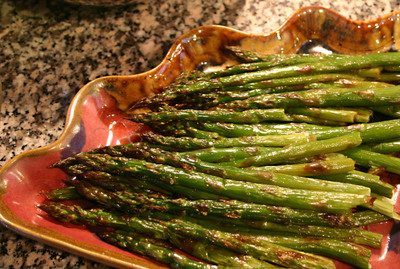 Asparagus is a great dish and the way you have prepared it looks awesome! I’ve got a few bunch of asparagus at home and I’m going to follow this recipe tonight to prepare them. One question though… 450 degree for how long? Christine emailed me and mentioned that we have to watch the asparagus while it roasts. Thanks for the tip! I’m definately making this dish tonight. Maybe you all are right — but we just hauled a bunch more in from the garden tonight. Risottos, omelets, quiches, stirfries… what am I forgetting? How about soup, custard, white pizza or blanched, chilled and served with dip? You’re making me hungry over here. I agree: We should just eat asparagus until it goes out of season again. But I have to say I never liked the trend to grill or roast asparagus. The flavor of asparagus is so ethereal, I think it gets completely lost over coals or in the oven. Poaching to just-doneness is still my favorite method.